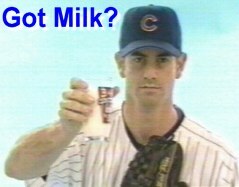  Mark's 10 strikeouts in his first start for the Cubs were the most by a Chicago pitcher in more than 30 years.  Mark got to swing the bat only one year at USC.  Mark and his family were in the stands at Candlestick Park for Game 3 of the 1989 World Series when an earthquake rocked San Francisco.  Mark graduated from High School with the single season records for strikeouts home runs (15) and RBIs .  One of the biggest thrills of his career was playing for the American squad on the Fourth of July.  When Mark was a teenager, his parents hung a framed picture of him between photos of Nolan Ryan and Roger Clemens. He begged them to take it down,wich they did.  As Mark walked to the plate in the first game after his debut at AAA Iowa the Cubs played the theme song to "The Natural."